What makes Lawrence Bay Lodge the fishing and hunting camp to choose? Reindeer Lake is one of the most productive lakes in the north because it drains a very large portion of northeast Saskatchewan and northwest Manitoba. Consequently, the food source for game fish is very good, better than most of the smaller lakes, which is why Reindeer Lake trout fishing is so incredible. The proof is in the fish. 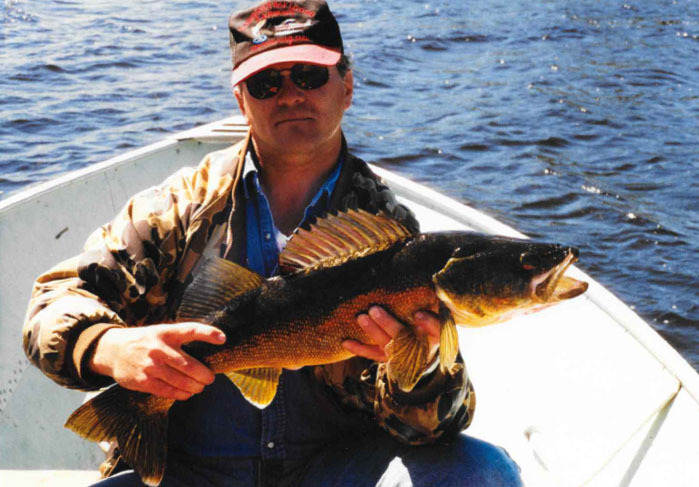 At Reindeer Lake and the surrounding outpost camps, you will find that the Northern Pike, Lake Trout, and Walleyes in our area are very heavy for their length, with the smaller heads and large stocky bodies. The lakes in our area have a large number of islands with many bays and large wood flats for big northern pike. We also have rocky points and deep waters, which get up to 760 feet deep, for the lake trout. When it comes to Northern Pike Fishing Resorts you can’t ask for better conditions. We have practiced a very strict program at Lawrence Bay Lodge to ensure that the larger fish are all returned to the lake. Typically, all the Northern Pike over 6-7 lbs. and Lake Trout over 6-7 lbs. are returned. I have never seen more big Northern Pike caught than what we have caught and released the last 5 seasons. Last year was unbelievable.Our guests were catching Pike up to 53″ long and a very large number of Northern Pike from 40″-49″. For great fishing, it doesn’t get any better. To make all this quality and quantity work for you, the guest, we have hired and kept the best fishing guides in the area, THE KEY TO YOU EXPERIENCING YOUR BEST FISHING TRIP!!! Our Saskatchewan walleye fishing can’t be beat! The equipment is also very important, we use New 18’ deep transom Lund boats with 40hp Mercury motors. All of the boats have seats with back rests and life jackets. We also have two floatplanes (a Beaver and a Cessna 180) that we use for our modern outpost camps. The floatplanes also bring a lot of diversity to the main lodge if you like fishing different small lakes for unbelievable walleye fishing on Reindeer Lake. All of the cabins at Lawrence Bay Lodge are fully modern with showers and flush toilets in every cabin and bathrooms are cleaned daily. The meals served at Lawrence Bay Lodge are first class and include Breakfast, Lunch, and Dinner. Lunch is an incredible shore lunch. We hold breakfast and dinner at the main lodge. There is also a large tackle counter in the lodge that is always a busy place in the evenings. Fishing in the evening at Lawrence Bay Lodge is very good. Just ask us and we will set it up for you. With the fishing quality, excellent equipment, great guides and diversity offered by float planes (with fly-in fishing), we know that Lawrence Bay Lodge, our incredible Northern Pike Fishing Resort in Saskatchewan is one of the very best at delivering a perfect fishing trip.